So If you read my before post about line splicing you can see my work midway though. This weekend I finished what I was making. It is the pennant for our mooring. 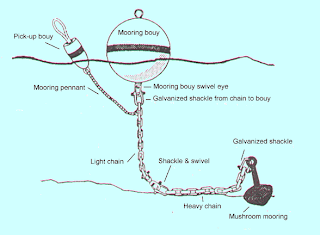 The mooring pennant I made was 30 feet long and goes from the anchor's chain to our mooring buoy. When we sail up to the mooring, we will grab the buoy and take up the floating pennant and attach it to the cleat on the bow of our boat. Sweet! How useful is that?! Whoa boating lingo. Whoa line splicing skills.